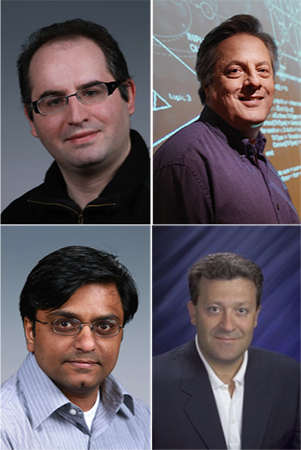 This fall, PNNL scientists Antonino Tumeo, of the Advanced Computing, Mathematics, and Data Division High Performance Computing group; Mahantesh Halappanavar, from ACMD Division’s Data Sciences group; and John Feo, co-director of the Northwest Institute for Advanced Computing, along with Intel’s Fabrizio Petrini, will team up as guest editors overseeing the first-ever thematic special issue of the Association for Computing Machinery journal, ACM Transactions on Parallel Computing, or TOPC. The “Special Issue on Innovations in Systems for Irregular Applications” will examine topics concerning irregular applications impacts on current and future system architectures. TOPC provides a forum for innovative work involving all aspects of parallel computing, including foundational research and experimental investigations. To encourage submissions for the special issue, a Call for Papers (CFP) has been released. Clockwise from top left: Tumeo, Feo, Petrini, and Halappanavar will guest edit a future issue of TOPC. Enlarge Image. In the issue, Tumeo and the other editors will assess irregular applications, which present unpredictable memory access patterns, control structures, and/or network transfers and typically operate on large data sets, such as graphs, sparse matrices, unbalanced trees, or unstructured grids. While often parallel, these irregular structures are difficult to partition on distributed memory systems in a balanced way, which affects scaling and performance. For the issue, the editors are seeking to showcase research that addresses irregular applications on existing or future system architectures or introduces new features involving micro or system architectures, networks, languages and libraries, runtimes, compilers, analysis, or algorithms. A more detailed list of potential topics is included as part of the CFP. Papers examining approaches that span multiple levels of the stack, ideally providing application-specific, end-to-end solutions, are especially welcome. Only technical articles with original research not currently under review by a conference or other journal will be considered. Tumeo also is asking that anyone with plans to attend the 8th Workshop on Irregular Applications: Architectures and Algorithms, known as IA3 2018, consider submitting papers for the TOPC thematic special issue. IA3 2018 will be held on November 12 in conjunction with this year’s SC18 computing conference in Dallas, Texas. Tumeo and Feo have served as primary organizers of the workshop since its inception in 2011. “I encourage that past and present authors of papers featured at the IA3 workshops should propose extended papers to the TOPC special issue,” Tumeo added. Paper submissions for this issue of TOPC will be accepted through Wednesday, Oct. 31, 2018. All manuscripts should be submitted using the Editorial Manager. To be considered for the publication, select article type, Special Issue: Innovations in Systems for Irregular Applications. The special issue likely will be published by ACM in October 2019. In addition to this future issue of TOPC, Tumeo and Feo have past partnered to co-edit several other special edition irregular-applications-focused journals, including the Journal of Parallel and Distributed Computing, IEEE’s Computer, and Parallel Computing. For more information regarding submission guidelines or topics related to the TOPC “Special Issue on Innovations in Systems for Irregular Applications,” contact Antonino Tumeo, Mahantesh Halappanavar, or John Feo.